Closed Loop Baltic (CLB) aims to develop a functioning prototype of circular system of food and energy production based on innovative but low-tech solutions for cold and sensitive coastal areas of the Baltic Sea. In contrast with conventional linear agricultural and industrial approaches causing nutrient run-off, the Closed Loop system recycles the nutrients in food and energy production, recirculating them between biogas digester and soil-free food production systems, reducing the nutrient run-off and carbon emissions in energy and food supply systems. Replication of the developed circular system in BSR would decrease local nutrient discharges into the Sea, which would benefit local communities, tourist centres, organisations and institutions working for sustainable development and environmental justice. Eutrophication is considered one of the major environmental concerns in the Baltic Sea region, resulting in biodiversity loss and negative ecosystem effects. CLB aims to develop and construct a year-round circular system for small-scale food and energy production to serve as a demonstrational model of nutrient leakages reduction and contribute to the change of the perspective on food and energy sources in the sensitive coastal region and cold climate. CLB is the integration of a) micro-biogas digester, which uses organic waste for energy production, b) aeroponics systems for soil-free growing of plants, c) geo-solar Climate Shell greenhouse using smart design and only renewable locally produced energy. The biogas system utilises organic waste to produce energy, plus produces a liquid nutrient solution as a by-product. The Climate Shell provides benign support systems. Organic waste becomes a valuable input for energy production; therefore potential nutrient leakage from organic waste is significantly reduced. The liquid by-product from the biogas production is used as the main input in the aeroponics system for food production. Thus, the system circulates the nutrients instead of allowing nutrient run-off. Aeroponics cultivation system is soil-free and enables the growing of plants without ploughing and fertilizers spreading in sensitive coastal areas, which leak from agricultural fields into the sea. This directly reduces the main source of nutrient discharges – agricultural lands. Techniques integrated in annualised Climate Shell allow avoiding fossil-fuel combustion emissions in food/energy production. After the model is completed it will be analysed, and an optimized design will be transformed into an online manual with instructions and information about the model, which can later be disseminated in the region as well as serve as demonstration for educational purposes. CLB aims to develop and construct a year-round circular system for small-scale food and energy production to serve as a demonstrational model of nutrients leakages reduction and contribute to the change of the perspective on food and energy sources in the sensitive coastal region and cold climate. external analysis of the prototype and creation of the educational manual. action research and experimenting for sustainable solutions,2) education for youth and adults,3) cross-border cooperation (between sectors and countries). 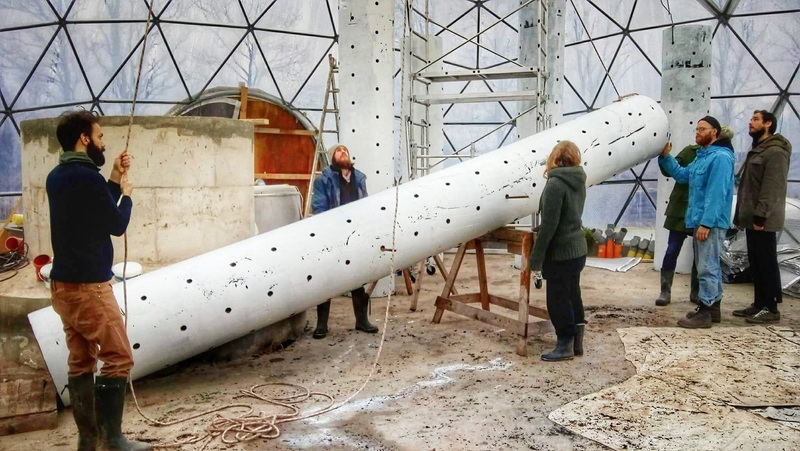 Activities of the first objectives include three co-dependent components: the geodesic Climate Shell, micro-biogas production and vertical soil-free food production (aeroponics). The biogas and food cultivation systems “feed” each other, while the Climate Shell allows production of biogas and fresh greens even in cold periods. Each of the components has integrated support systems, such as production of renewable energy, climate control, water supply, etc. The second Objective requires professional analysis of the prototype by the Finnish Natural Resource Institute, which will result in recommendations for the optimized model that will be integrated in the online manual of the closed loop system. The island of Gotland as the pilot, Baltic Sea coastal areas as the addressed region.